MONSOON is the time to feast on green leafy vegetables, particularly for the Soligas, an indigenous tribal community of the Western Ghats. The Soligas of Karnataka’s Male Madeshwara Hills reserve forest are intimate with the forest and have a remarkable knowledge of wild and leafy vegetables. They collect more than 50 such vegetables and fruits for different uses. During the rainy season, they collect more than 30 leafy vegetables that are high in iron and nutrition. Most Soliga households at this time are filled with the aroma of delightful dishes. 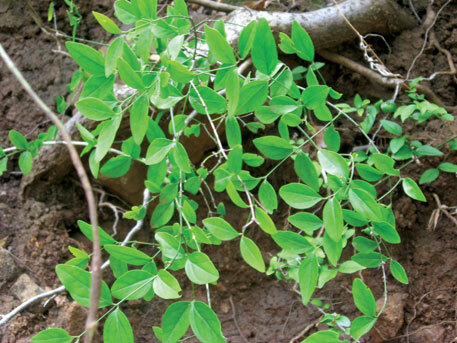 Kaddisoppu (Jasminum trichotomum), which belongs to the Oleaceae family, is a shrub found abundantly just before the monsoon arrives in this forest area. It is bitter in taste, rich in iron, magnesium, methanolic, alkaloids and phytosterols. The Soligas collect kaddisoppu from the forest while gathering fuelwood or non-timber forest products, or while grazing cattle. The tender leaves of kaddisoppu protect them from monsoon maladies. They have discovered that kaddisoppu is a particularly good medicine for cold, cough and flu. It also works wonders on people with stomach infections, especially dysentery and stomach ache. Forty-year-old Chikkmadaiah, who lives in Gorasane village near Male Madeshwara Hills temple, prepares uppusaru with tamarind which, he says, combats stomach infection. A recent pharmaceutical study published in the International Journal of Research in Ayurveda and Pharmacy states that extract of kaddisoppu leaves significantly reduce pain, fever and inflammation. It is not just the medicinal values that the Soligas love about kaddisoppu. They relish its taste as well. The simple uppusaru dish is prepared in almost each Soliga household. 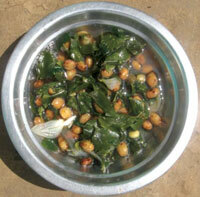 The green leaf stew is made with garlic and onions and eaten with steamed ragi balls. It is a very common dish in south Karnataka during monsoons. 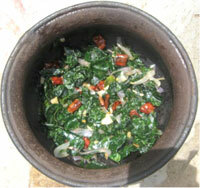 The leaves are also stir fried and consumed as a side dish. Heat oil in a pan. Add garlic and onion, and fry till they turn golden yellow. Add the chillies. Put properly rinsed kaddisoppu in the pan, add salt and stir till the leaves become a little crispy and seasoned. The curry is ready. Serve hot with rice or ragi balls. Take dry field beans. Roast them in a hot pan without oil for five minutes. Boil this in water for 10 minutes. Add kaddisoppu to the water and boil the two together for another three minutes. Add onion and salt. Boil till all the ingredients blend. Heat oil in a separate pan. Add chillies and garlic, stir for a few seconds and add the boiled mixture. Cook for a few minutes. Serve hot with rice or ragi balls. Jasminum trichotomum is wild jasmine plant grows in dry forest. I kannada it is locally called kaddimallige soppu. It is also gives flower with fragrant jasmine smell, it looks very similar to jasmine.It is also belongs to Jasmine family.